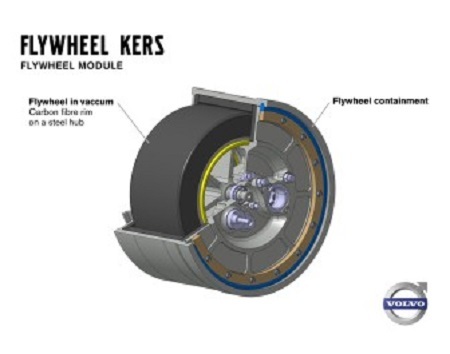 The Volvo Car Group has completed extensive testing of kinetic flywheel technology on public roads, which is said to reduce fuel consumption by up to 25%.”The testing of this complete experimental system for kinetic energy recovery was carried out during 2012. The results show that this technology combined with a four-cylinder turbo engine has the potential to reduce fuel consumption by up to 25% compared with a six-cylinder turbo engine at a comparable performance level,” says Derek Crabb, Vice President Powertrain Engineering at Volvo Car Group, “Giving the driver an extra 80 horsepower, it makes car with a four-cylinder engine accelerate like one with a six-cylinder unit.”The experimental system, known as Flywheel KERS (Kinetic Energy Recovery System), is fitted to the rear axle. During retardation, the braking energy causes the flywheel to spin at up to 60,000 revs per minute. When the car starts moving off again, the flywheel’s rotation is transferred to the rear wheels via a specially designed transmission.The combustion engine that drives the front wheels is switched off as soon as braking begins. The energy in the flywheel can then be used to accelerate the vehicle when it is time to move off again or to power the vehicle once it reaches cruising speed. In the past, a flywheel unit made of steel is too large and heavy to be applicable. The flywheel that Volvo Cars used in the experimental system is made of carbon fiber. It weighs about 6kg and has a diameter of 20cm. The carbon fiber wheel spins in a vacuum to minimize frictional losses.According to Volvo, the fuel savings will be greatest when driving in busy urban traffic and during active driving. If the energy in the flywheel is combined with the combustion engine’s full capacity, it will give the car an extra 80 horsepower. “The flywheel’s stored energy is sufficient to power the car for short periods. This has a major impact on fuel consumption. Our calculations indicate that it will be possible to turn off the combustion engine about half the time when driving according to the official New European Driving Cycle,” explains Mr Crabb.”We are the first manufacturer that has applied flywheel technology to the rear axle of a car fitted with a combustion engine driving the front wheels. The next step after completing these successful tests is to evaluate how the technology can be implemented in our upcoming car models,” he added.